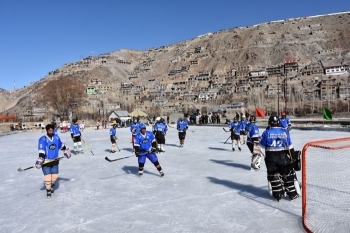 A three-day long 10th CEC Ice Hockey Cup tournament organised by District Youth Service and Sports Department was concluded on February 8 at Khree Sultan Cho Ice Hockey Rink Kargil. Advocate Mohammad Amir, Acting CEC Kargil was the chief guest at the concluding day. Eight teams participated in the tournament. The final match was played between, Winter Sports Club Shakar Chiktan and Friends Pashkum in which the former won the match by 7 goals. With the overall best performance, Shabir Shah, Captain was declared the man of the match and won Rs 50,000 Prize money for the team. Meanwhile, Asgar Ali of Friends Pashkum team was declared as the man of the Series. The runner-up team, Friends Pashkum was presented with the prize money of ₹ 30,000. He further added, “Today, sports are one of the most lucrative professions and such sports will not only help youths to excel at the national level but they can also represent at the International level very easily". He informed that Hill Council, Kargil is fully committed to the promote winter sports in the district. The prize money has been increased to ₹50,000 and ₹30,000 and ₹7,000 consolation prize to each participating team. He assured the players to enhance the infrastructure facility for the players in Kargil. In the end, the prizes were distributed among the winner, runners-up and the participants of basic ice hockey camp.